One of the big stories in the investment world over the last week or so has been the sharp decline in oil prices. The commodity has seen prices fall for 12 straight days and that is longest losing streak ever. There is also a weekly losing streak of six straight weeks, but that isn’t a record. While the financial news is focused on the fall and the ongoing battle of words between President Trump and the OPEC nations, there are some technical factors that should start coming in to play. 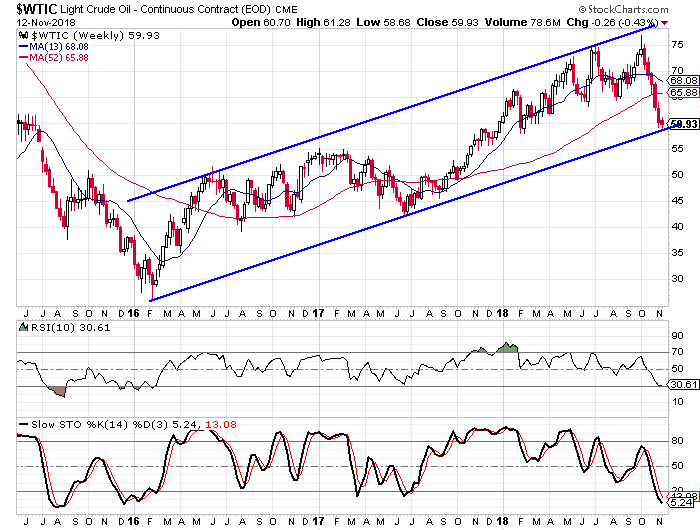 The weekly chart shows that oil has been trending higher over the past two and a half years. If you connect the lows from 2016 and 2017, the trendline that is created puts the current price right around that trendline at this time. I couldn’t help but notice that the highs were on the same plane and that created a trend channel for oil. In addition to the trend channel and the potential support from the lower rail, the overbought/oversold indicators are at their lowest levels since early 2016. We see that the 10-week RSI came close to reaching oversold levels in June ’17 while the weekly stochastic readings did reach oversold territory at that time. That was the second point that created the trendline. Prior to those low readings in the oscillators, the last time they were both in oversold territory at the same time was in early 2016 when the upwardly sloped channel first started. Even if the price of oil falls below the lower rail of the channel, there is another potential support point in the $55 area. If you look at late 2016 and early 2017, the rally in oil stalled in that area during the first quarter of ’17. Many times when you see a rally stall at a certain point and then rally through that price, when prices start falling the former resistance becomes support. In addition to the technical factors, the sentiment toward oil has been turning less bullish in the last few months. The most recent Commitment of Traders report from the CFTC shows that large speculators are long just over 400,000 contracts. Large speculators never really turn bearish and over the last 12 years they have never had a net short position. To gauge the sentiment of the group, you have to compare the net long position to past readings. The last time large speculators were long less than 400,000 contracts was in 2017. From April through early July ’17, the group was net long between 325,000 and 390,000 contracts for 12 straight weeks. It was during that stretch that the price of oil hit bottom in the $42 area. It was also during that stretch that we last saw a weekly losing streak of at least five weeks. The debate between President Trump and Saudi Arabia and other oil producing countries is certainly weighing on the minds of traders. President Trump has pushed for the countries to keep production levels where they are, but the oil producers don’t want to do that as the price is falling. There comes a point where oil production will fall because of economic factors. If a company’s cost to produce a barrel of oil becomes greater than the price they can sell it for, the company will cut production—period. There is also the basic economic relationship between supply and demand. 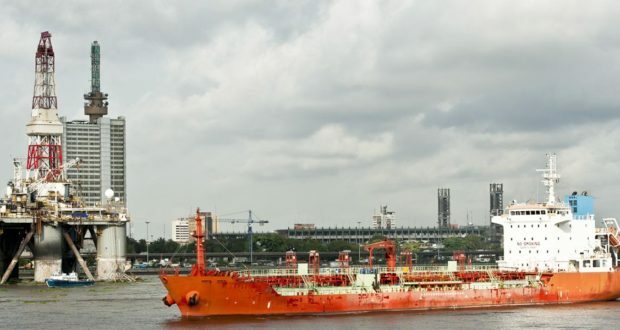 OPEC cut its 2019 global demand forecast in its November report that was released on Tuesday. That is the fourth straight month that the cartel has lowered its demand forecast. While President Trump might like oil and gas prices being down, it is bad business for companies and countries to keep producing oil while the price and demand are falling. Personally, I look for oil prices to stabilize in the next week or so and then start to rise. I wouldn’t necessarily jump in and go long oil right away, but rather I would wait for a sign that the bottom has been reached. Seeing a bullish crossover in the weekly stochastic readings or something along those lines would be my trigger.